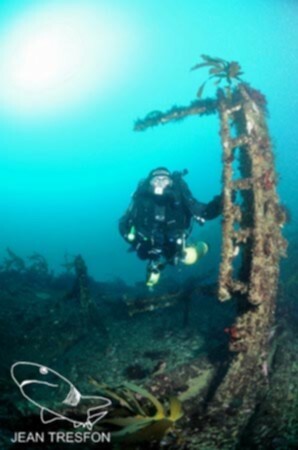 The dive site MV Ker Yar Vor and the Jo May is a recent wreck site on an inshore rocky reef in the Karbonkelberg area on the Atlantic seaboard of the Cape Peninsula, near Cape Town in the Western Cape province of South Africa. These two wrecks lie next to each other approximately between the Maori and the Gelderland. 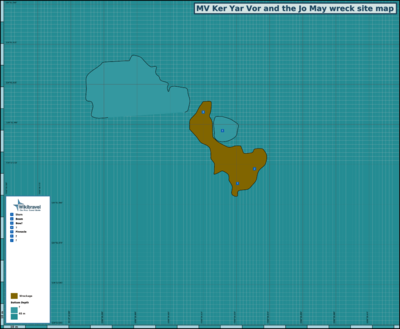 The name "MV Ker Yar Vor and the Jo May" refers to the two wrecks which are the features at this site. The Jo May sank first and not much of her remains. Maximum depth is about 28m. The top of the wreckage is about 24m, and the local high part of the reef is at about18m. Average depth of a dive at this site is likely to be about 24m. See SAS Gelderland. Visibility on a good day may be in excess of 20m, but is more likely to be less than 10m. A plankton bloom following an upwelling may reduce visibility at the surface, but it may improve considerably at depth, though it will probably be quite dark in these conditions. The Ker Yar Vor is quite broken up, but the stern is still recognisable. It is the southernmost part of the site, which lies largely in a gap between a large pinnacle to the north east and a more extensive area of high reef to the west. Most of the Ker Yar Vor is in relatively small peices. The Jo May is represented by a few pieces of wood. One is quite a large beam with brass or bronze drift bolts. This lies amongst the wreckage of the Ker Yar Vor to the east of the wreck. Geology: Pre-Cambrian granite of the Peninsula pluton. Conditions will be similar to SAS Gelderland, but the wreck is slightly more sheltered from south westerly swell by Duiker Point. The site is exposed to north westerly winds and seas, so should be dived when the wind is from the south, preferably south east, and is often good in strong south easterly winds when most other sites are too exposed to be safe. The site is reasonably protected from south westerly swell. The site is usually at it's best in summer but there are also occasional opportunities in other seasons. This is an area which sometimes has upwellings of clear cold water, caused by strong south easterly winds, resulting in good visibility (may exceed 20m) and cold temperatures (as low as 8°C). Like the rest of the bay between Oude Schip and Duiker point, the reef life is relatively low in invertebrate diversity, and dominated by algae, so it tends to be pinks, reds and browns. There are a few splashes of colour, and quite a number of sea urchins, but this is not a site for critters. The main feature of the site is the wreckage of two vessels, one in fairly broken, but still interesting condition, the other almost totally broken up and mostly gone. Wide angle photography of the wreckage and surrounding reef structure is most likely to be worthwhile. On a good day the lighting may be adequate, and on a bad day, go somewhere else, or dont bother to try photography. The site is small and compact, and may be comprehensively visited on a single dive. This is the wreck of a small steel vessel. There may be sharp edges and pointy bits to snag the unwary diver, particularluy if the visibility is poor and surge strong. There may be places an uncautious diver could find to get trapped, but they are not obvious. There are no obvious penetration opportunities, and if there are, the interior space will be quite small. Hypothermia is far more of a risk. No special skills recommended. Divers should be certified and competent to dive the depth. and ability to deploy a dsmb may be useful, however the site is compact and is should usually be possible to return to the shot line. Dry suits or very good wet suits are recommended, and Nitrox can significantly extend the dive time of a well insulated diver. This page was last edited on 5 December 2011, at 19:06.